Too many religious property owners make the mistake of hiring general contractors who might do outstanding work repairing modern homes and commercial buildings but don’t have experience working specifically with the architecture and materials that are unique to older religious structures. We see this all too often when we’re called upon to correct someone else’s mistakes. 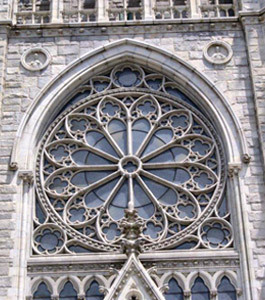 Our sole focus is the repair, restoration and rehabilitation of religious properties, and that experience in such a specialized field will save you money. We can show you the cost savings that result from restoring and preserving the original design and architecture of your structure instead of redesigning or rebuilding. Imhoff Company is uniquely qualified to do this, with a peerless knowledge of how these buildings are made, decades of hands-on experience and a library of church architecture that goes back nearly 100 years. You’ll save money because more than 95% of our work is completed in-house in our own stone fabrication and cutting facility, full-service sheet metal shop and custom millwork manufacturing facility. Only specialty services like electrical, HVAC or plumbing are subcontracted. Every staff member must complete intense training, including OSHA (Occupational Safety & Health Administration) training, before being permitted to work in our facilities or on a job site.